Music Appreciation with Zeezok Publishing! The last time I share a music review, I think Beethoven was composing his 5th Symphony. When I was asked to review Music Appreciation for Elementary Grades (Book One) from Zeezok Publishing LLC., I was ecstatic. I guess you could say I was on a “major note.” My band geekiness is in full swing today. We are huge supporters of the Charlotte Mason method of educating. It should come as no surprise that I had my eye on this music appreciation study for quite some time. That’s the treble with music appreciation, I C-sharp music curriculum! Charlotte Mason believed in studying composers and great music. Speaking generally of both subjects, music and art, I have a strong feeling that . . . one of the chief objects . . . should be to cultivate the aesthetic sense . . .” – from Parents’ Review article. The Charlotte Mason method of studying music is geared toward every child, regardless of age, to study together simultaneously. As I stated earlier, I’m a huge supporter of the Charlotte Mason method, especially with multiple children of different ages. Seven (yes, 7!) Composer Biographies! I have three boys ranging in ages from 7 to 12. I have three boys, different ages with distinct separate learning styles. If you are currently teaching multiple children (or have taught multiple children in past) of differing ages with separate learning styles, you know the struggle can be real! 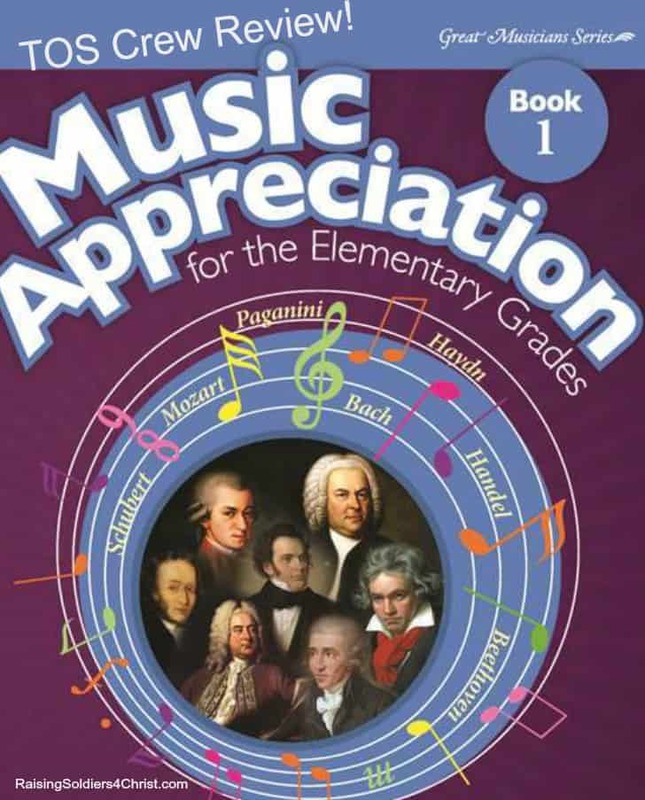 However, the Music Appreciation for Elementary Grades (Book One) adapts to each of them! My boys loved the curriculum and it kept them interested and, more importantly, they yearned for the knowledge! The lap book CD is absolutely wonderful. If you haven’t had the pleasure of lap booking, this is an excellent curriculum to learn with. My boys enjoy the switch from seat work to lap book work. I like to keep things interesting for them. The lap book CD covers a wide array of subject areas. The CD complements the weekly lessons very well. Listening to good music is essential to any music curriculum. I give this program a 5 out of 5 rating! I am completely in awe of the entire curriculum. I even tried to find something to improve upon and I couldn’t! The price of this curriculum $169.99. However, let’s be honest. Considering all the material received with Music Appreciation for Elementary Grades (Book One), this is an excellent price! Remember that life without music would B♭!